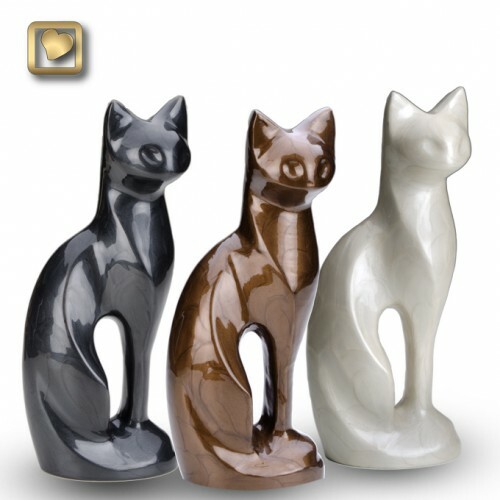 The Pearlescent Bronze Cat Cremation Urn features a beautiful bronze pearlescent enamel finish over real brass. The urn is protected with a GlossCoat™ and comes with an attractive velvet pouch. 9.5" H C 4" W x 3" D - Holds 16.5 Cubic Inches - Keep in mind that the plastic bag holding the cremains is going to take up about 7 cubic inches of room in the urn. One pound of body weight equals approximately 1-1.5 cubic inches of volume. This is an estimate only. Some pets may require a larger urn.